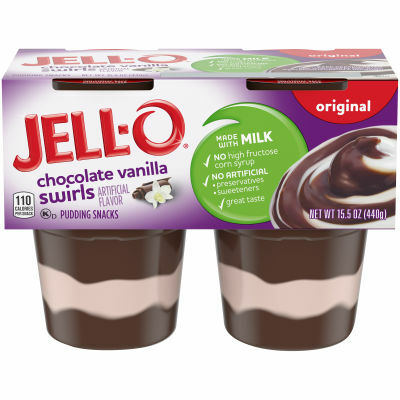 Chocolate Vanilla Swirls Pudding - Treat your taste buds to the tantalizing mix of chocolate and vanilla flavor with Jell-O Chocolate Vanilla Swirls Pudding Snacks. This ready-to-eat this treat contains 110 calories per serving and is ideal as a sweet snack or dessert throughout the day. A Quick Snack Fix - A perfect choice at home or as a tasty on-the-go treat you can savor anytime, Jell-O snack cups are quick and easy to pack and take with you. Grab one for a quick dessert fix at home, work or school. Scrumptious Jell-O pudding cups are a fun and convenient treat for adults and kids alike. Serving size 1 snack (110g).